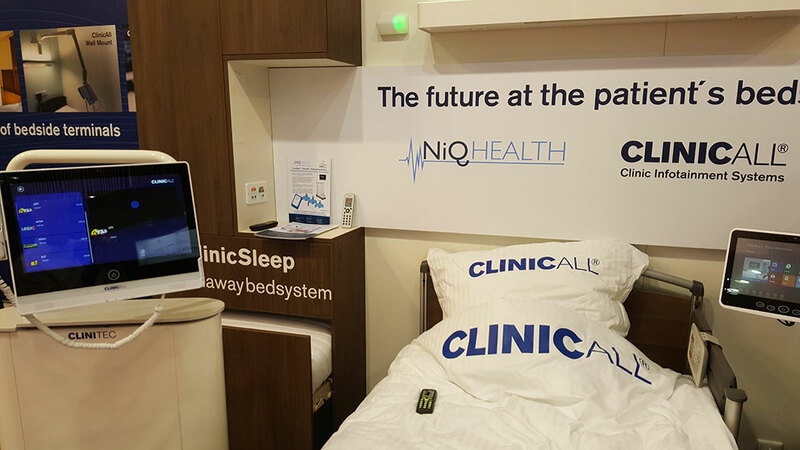 NiQ Health, in partnership with ClinicAll®, showcased their integrated CarePlus™ nurse call and ClinicAll patient infotainment solution at the Arab Health 2016 conference. The Arab Health Exhibition & Congress is the largest healthcare event in the Middle East. This year’s event was held at the prestigious Dubai International Convention and Exhibition Centre from January 25 to 28. Arab Health 2016 attracted more than 130,000 healthcare professionals across the globe and over 4,000 international exhibitors showcasing advancements in healthcare technology and solutions. CarePlus™ Nurse Call and Care Management Information System provides smart prioritization of the patient calls, based on their need and acuity, and delivers directly to the assigned staff member. This advanced feature of the CarePlus™ system significantly improves the efficiency and workflow of nursing staff through delivery of the right message to the right caregiver. The integration of CarePlus™ nurse call with ClinicAll patient infotainment terminals offers significant improvement to patient satisfaction and better hospital experience.